Hello Friends!! I want to share the third card of the ones that I will be doing at a fundraiser to help a beloved teacher from Oliver's Day Care. 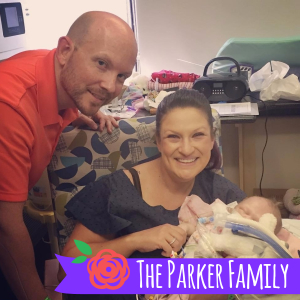 April Parker recently had a baby girl Dallas Jane Parker, but unfortunately she has not been able to come home and still remains at the hospital as she is really sick, Little Dallas has been fighting for the life since the first second she arrived to this world!, she truly is a fighter! Below a picture of Mom and Dad holding little Dallas for the very first time. If you want to help me raising funds for this sweet family, you can come to the live event on November 17th if you are local to me (Frisco TX) or you can get the hand made cards, and I will mail them to you.. The last day to sign up is November 10th!! This card features the Merry Mistletoe stamp set, I love how simple and elegant this is.. the background was embossed using the Holly embossing folder, I just love how this looks..
By now you should know that I love making quick and simple cards yet they look beautiful, don't you think? Bellow the video tutorial, where I show you how to make this card!, you can see it really is very easy to create..
And if you want to get any of the items I used to create this card, you can click on the images below to go to my online store to be able to purchase these items. I appreciate your support.